What are Enzymes Made of? Enzymes are the biological catalysts. Living organisms carry out thousands of chemical reactions which take place in dilute solution at ordinary temperature and pressure. For example they can use small molecules to assemble complex biopolymers such as proteins and DNA. Organisms can produce molecules that combat bacterial invaders. They can break down large, energy-rich molecules in many steps to extract chemical energy in small portions to drive their many activities. Enzymes are protein molecules, and so are made up of amino acids. These amino acids are joined together in a long chain, which is folded to produce a unique 3D structure. Most Highly Effective: One molecule of an enzyme may transform million molecules of the reactant into product , per minute. Highly Specific Nature: Each enzyme is specific for a given reaction, i.e. one each enzyme is specific for a given reaction, i.e. one enzyme can not catalyse more than on ereaction. Highly Active at Optimum Temperature: The rate of enzyme catalysed reaction becomes maximum at a certain temperature called optimum temperature. For most of the enzymes, the optimum temperature is 298-310 K.
Influence of activators and coenzymes: When a small non-protein(vitamins) molecules is present with an enzyme, the catalytic activity of enzyme enhances considerably. These are called co-enzymes. Similarly, the metal ions like Na+. Mn2+, Co2+ etc, when weakly bonded to enzyme molecules, increase their activity. These ions are called activators.?? Molecular weight : Enzymatic proteins are substances of high molecular weight. Peroxidase one of the smaller enzymes has molecular weight of 40,000, where as catalase one of the largest-has a molecular weight of 250,000 (urease 483,000). Enzyme molecules are therefore larger than those of usual simple organic substances but are nevertheless small enough to dissolve completely in aqueous media to yield clear nonturbid solution. Amphoteric nature : Each molecule of enzyme possess numerous groups which yield H+ in slightly alkaline solutions and groups which yield OH– ions in slightly acidic solutions. Unlike many other substances, therefore, the enzymatic protein is amphoteric, i.e., capable of ionizing either as an acid or as a base depending upon the acidity of the external solution. Colloidal nature :  All enzymes are colloidal in nature  and thus provide large surface area for reaction to take place. They posses extremely low rates of diffusion and form colloidal system in water. 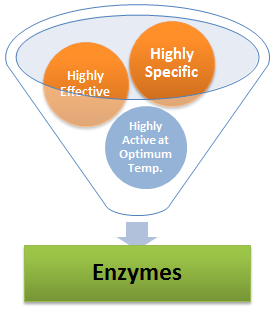 Specificity of enzyme :  Most of the enzymes are highly specific in their action. A single enzyme will generally catalyse only a single substrate or a group of closely related substrates. e.g. the enzyme lactase catalyzes the hydrolysis of lactose and no other disaccharide and the enzyme malic dehydrogenase  removes hydrogen atom from malic acid and not from other keto acids. The enzymes posses active sites which are highly specific centres composed of varying number and sequence of amino acids. The active site possess a particular binding site which complexes only with specific substrate. Thus, only a suitable substrate fulfils the requirements of active site and closely fixes with it. Heat specificity :  The enzymes are thermolabile i.e. heat sensitive. They function best at an optimum temperature (20°C-40°C). Their activity decrease with decrease as well as increase in temperature and stops at 0°C and above 80°C. Catalytic properties : Enzymes are active in extremely small amounts, e.g. on molecule of invertase can effectively hydrolyze 1,000,000 times its own weight of sucrose. One molecule of catalase is able to catalyze conversion of 5,000,000 molecules of hydrogen peroxide. The enzyme remains unchanged, qualitatively or quantitatively after the reaction. Reversibility of reaction : The enzyme-controlled reactions are reversible. The enzymes affect only the rate of biochemical reactions, not the direction. They can accelerate the reaction in either direction, i.e. onwards and backwards depending upon the availability of suitable energy sources e.g. Lipase can catalyase splitting of fat into fatty acids and glycerol as well as synthesis of fatty acids and glycerol into fats. 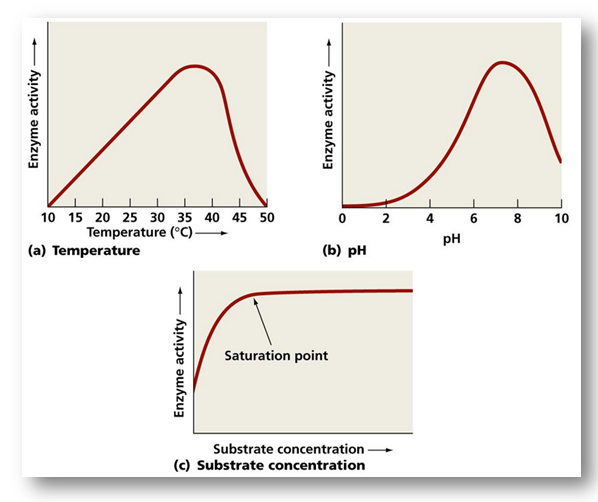 pH sensitivity : The enzymes show maximum activity at an optimum pH (6-7.5). Their activity slows with decrease and increase in pH till it stops. Each enzyme has its own different favourable pH value. High efficiency : The effectiveness of an enzymic reaction is expressed in terms of its turn over number or catalytic centre activity means number of substrate molecules on which one enzymes molecules acts in one minute. Turn over number depends on the number of active sites of an enzyme. An active site is an area of the enzyme which is capable of attracting and holding particular substrate molecules by its specific charge, size and shape so as to allow the chemical change, Enzymes show 3-D structure. R (alkyl) groups of amino acids from active sites during folding polypeptide chains. Usually 3-12 amino acids form an active site. More the member of active sites, more is the turnover number of enzymes. 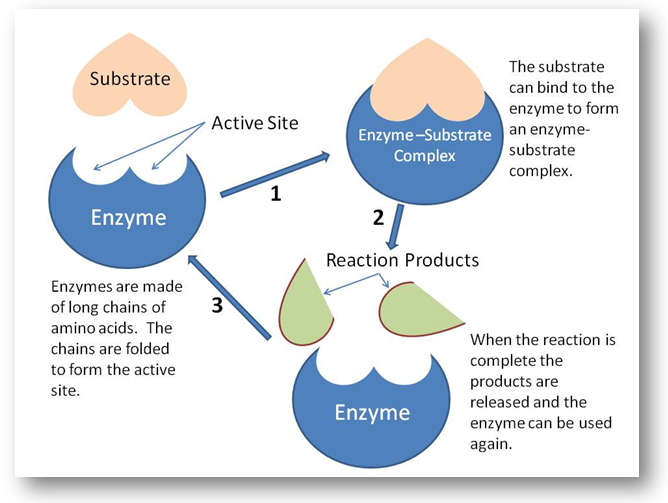 Enzyme react with substrate only at these active sites. 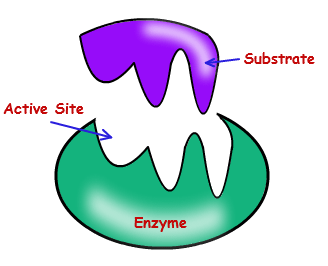 The whole surface of enzyme is not reactive. Enzymes have high turn over number (Catalytic number). Highest turn over number is of carbonic anhydrase (36 million/min or 600000 per second) and lowest is of lysozymes (30/min or 0.5 per second). So carbonic anhydrase is fastest enzyme. It has zinc as activator. It hydrates 36 million CO2 molecules per minute in RBC into H2CO3­. Turn over number depends upon number of active sites, rapidity of reaction and separation of end product. Team work : The enzymes generally work in teams in the cell, the product of one enzyme controlled reaction serving as the substrate for the next. In germinating seeds, starch is changed into glucose by two enzymes : amylase and maltase. Amylase splits the starch into the double sugar maltose, which is then broken by maltase into the single sugar glucose. Eleven different enzymes work sequentially to convert glucose to lactic acid in animal as well as plant cells. Destruction by poisons : Enzymatic activity can be retarded or inhibited by the use of toxic substances like cyanide and iodoacetic acid, cyanide destroys the respiratory enzyme cytochrome oxidase. The basic mechanism by which enzyme chemical reaction begins with the binding of the substrate to the active site on the enzyme is based on the active site of enzyme. Active site is the specific region of the enzyme which combines with the substrate. The binding of the substrate to the enzyme causes changes in the distribution of electrons in the chemical bonds of the substrate and ultimately causes the reaction. The products are released from the enzymes surface to regenerate the enzymes for another reaction cycle. The remarkable specificity of enzymes results from the fact that each enzyme has a specific, active site on its surface. When the reactant molecules, called the substrates of the reaction, bind at the active site, a chemical change is initiated. In most cases, substrates bind to the active site through intermolecular forces: H-bonds, dipole forces and other weak attractions. Two models of enzyme action have been proposed. According to the lock-and-key model, when the ‘key (substrate) fits the ‘lock’ (active site), the chemical change begins. Lock and  key model for enzymatic catalysis was first postulated in 1894 by Emil Fischer. However, modern X-ray crystallographic and spectroscopic methods show that in many cases, the enzyme changes shape when the substrate lands at the active site. This induced-fit model of enzyme action pictures the substrate inducing the active site to adopt a perfect fit, rather than a rigidly shaped lock and key. Therefore, we might picture a hand in a glove, in which the ‘glove’ (active site) does not attain its functional shape until the ‘hand’ (substrate) moves into place. The rate of enzyme catalyzed reaction changes from first-order to zero-order as the concentration of substrate is increased. The induced fit model assumes that the substrate plays a role in determining the final shape of the enzyme and that the enzymes are partially flexible. This explains why certain compounds can bind to the enzyme but do not react because the enzyme has been distorted too much. Other molecules may be too small to induce the proper alignment and therefore cannot react. Only the proper substrate is capable of inducing the proper alignment of the active site. Enzymes  are used in industrial processes such as: Baking, Brewing, Detergents, Fermented products, Pharmaceuticals, Textiles, etc Enzymes have been used in the making of cheese, yoghurt, bread, beer, wine etc. Enzymes allow certain industrial processes to be carried out at normal temperatures and pressures, thereby reducing the amount of energy and expensive equipment needed. The enzymes in yeast break down sugar into alcohol (ethanol) and carbon dioxide gas. Like all chemical reactions, enzymatic reactions are sensitive to environmental conditions. Thus, the substrate concentration, enzyme concentration, pH. temperature and inhibitors all affect the rate of enzymatic reaction. These factors affect the active site of the enzyme and formation of the enzyme-substrate complex. Substrate concentration : If there are more enzyme molecules than substrate molecules, a progressive increase in the substrate molecules increases the velocity of their conversion to products. However, eventually the rate of reaction reaches the maximum. At this stage the active sites of all the available enzyme molecules are occupied by the substrate molecules. Therefore, the substrate molecules occupy the active sites vacated by the products and cannot increase the rate of reaction further. Enzyme concentration : The rate of reaction is directly proportional to enzyme concentration. An increase in enzyme concentration will cause a rise in the rate of reaction up to a point and them the rate of reaction will be constant. Increasing the enzyme concentration increases the number of available active sites. Product concentration : Accumulation of the product of enzyme reaction lowers the enzyme activity. Enzyme molecules must be freed to combine with more substrate molecules. Normally the product are quickly removed from the site of formation and the reaction does not suffer. Hydrogen ion concentration (pH) : Some enzyme act best in an acid medium, other in an alkaline medium, for every enzyme there is an optimum pH where its action is maximum e.g. 2 for pepsin, 6.8 for salivary amylase, 8.5 for trypsin. Most enzyme show maximum activity in a pH range of about 6.0 to 7.5 i.e.,near neutral pH (endoenzymes). A shift to the alkaline or acid side rapidly decreases the enzyme activity and finally stops it altogether. This is due to denaturation of enzyme molecule i.e. change in its physical structure. The H+ ions combines with negatively charged R groups on the enzyme. This electrically neutralizes the R groups and distrupt ionic bonds in the enzyme's folding pattern, thus changing its shape. Temperature : Within certain limits (5-40°C) the rate of an enzyme catalysed reaction increases as the temperature increases. The Q10 of most enzymatic reactions is 2, i.e., every 10°C rise in temperature doubles the rate of reaction. Most enzymes show maximum activity in a temperature range of 25 to 40°C. Beyond this temperature, there is sharp fall in the rate of reaction. Rise in temperature increases the kinetic energy of the molecules. Therefore, at higher temperature an increasing number of molecules have the required activation energy and can take part in chemical reactions. At higher temperatures, the kinetic activity of molecules in an enzyme becomes strong enough to break the weak hydrogen bonds that maintain the tertiary structure of the enzyme. Modification in the physical form of the enzyme results in the loss of its catalytic activity. This change in structure is called denaturation of protein. This is the permanent change, and the denatured enzyme protein remains inactive even if the temperature is then brought down. The enzymes are not destroyed by freezing, and regain their lost activity if the temperature is raised to normal. Dry seeds can tolerate higher temperatures as compared to germinating seeds because dry seeds have dehydrated enzymes. Deep freezing of food for preserving them for long periods is done not only to prevent the growth and multiplication of microorganisms but also to inactivate enzymes. It makes impossible for the microorganisms to digest the food. Enzyme inhibitors : Certain chemical compounds inhibit activity of enzyme molecules either permanently or temporarily. Thus, di-isopropyl flurophosphate (DFP) inhibits the action of various enzymes catalysing hydrolysis of ester linkage. Inhibition is permanent or irreversible. On the other hand, some antibacterial drugs and poisons do not cause permanent damage to the functional groups of the enzyme and therefore, if these (inhibitiors) are removed, the enzyme becomes fully functional. Poisons and radiation : Poisons such as cyanide and radiation destroy the tertiary structure of the enzymes, making them ineffective. a. increases with increase in temperature. b. decreases with increase in temperature. c. first increases and then decreases with increase in temperature. d. is not affected by change in temperature. 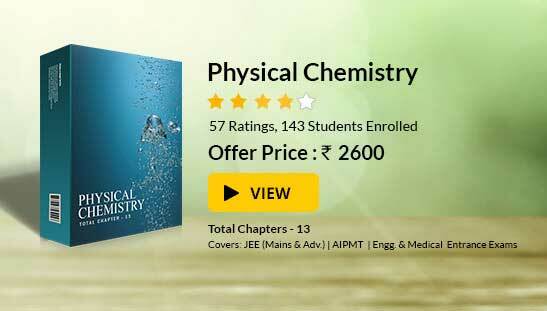 To read more, Buy study materials of Surface Chemistry comprising study notes, revision notes, video lectures, previous year solved questions etc. Also browse for more study materials on Chemistry here.